Taking your dog out to play a little fetch is something both owner and dog must both enjoy. Nighttime presents an obvious problem that most dog owners can rate in the amount of tennis balls they’ve lost in the dark. Some of us however, don’t have much of a choice, as work and other commitments during the day prevent us from taking our pooch out for a little playtime. With the Nite Ize Meteorlight K-9 LED dog ball, that problem disappears in technicolored wonder. The Meteorlight dog ball is a LED rubber ball, and is battery operated. It’s a fun little toy that your furry pal will truly love. A little heavier than a tennis ball (4-5 oz. ), but the same size (2.55″), and can still fit inside a Chuck-It. The button to turn it off and on takes quiet a bit of pressure to work, which is a good thing. When it goes soaring through the air shining a surprisingly bright shade of green, it will remain glowing after bouncing off the ground. Some people have said that if you use it against a hard enough surface, such as compact dirt or gravel, that it begins to turn off after hitting the ground. Though this is after some use (a few months), it still might be a good idea to keep it on grass or loose dirt. There have also been a few instances when the cork holding in the light bulb has popped out under the same circumstances. So this toy might be better used in a less rural area. • Fun exercise toy used for throwing and retrieving in a supervised setting. This product is not a chew toy. • Turn on and off by pressing and holding switch – will not turn off when bounced. • NOT A CHEW TOY. Use with constant supervision. Do not leave unattended with the animal. • Shouldn’t be used against hard surfaces such as compact dirt and gravel. 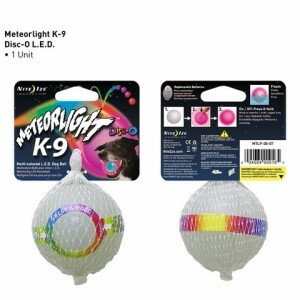 To sum it all up, the Meteorlight K-9 LED dog ball is a bright sphere of multicolor light, in an otherwise dark and most likely chilly situation. Though it isn’t indestructible, and you shouldn’t let your dog knaw away on it, it is a very entertaining convenience for any dog owner and their pooch.